This beautiful space wallpaper, taken during a time lapse set at the Atacama Large Millimeter/submillimeter Array (ALMA) is another dramatic Ultra High Definition photograph from the ESO Ultra HD Expedition. This beautiful space wallpaper, taken during a time lapse set at the Atacama Large Millimeter/submillimeter Array (ALMA) is another dramatic Ultra High Definition photograph from the ESO Ultra HD Expedition. The spectacular javelin of light over the ALMA array is a shooting star, slicing through the image in a vivid streak of colors. Emerald green, golden and faint crimson hues blaze brightly as the meteor burns up as it enters the Earth’s atmosphere and makes its fiery voyage across the sky. 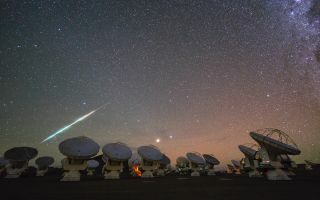 As the high-speed fireball — which is, in reality, a small grain of rock from interplanetary space — interacts with the atmosphere it heats up, vaporizing the surface layers of the meteor, which are left behind in a glowing trail. These trails disappear in just a few seconds, but are captured here at the click of a button. This image was released April 7, 2014.